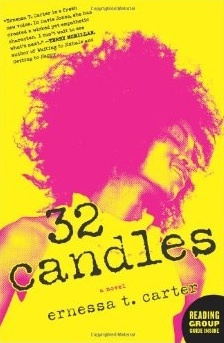 When I described the opening of 32 Candles to a friend –poor, dark-skinned, black teen obsessed with John Hughes films and their happy endings dreams about being the star of her own fairy tale romance – my friend said: “That sounds like a book about you.” I chose not to take offence to her comment, after all, it’s 95% true. I love the novel’s lead character Davie Jones because like me she grew up on Pretty In Pink and The Breakfast Club and harboured the quiet hope that one day a gorgeous, charismatic guy would recognise the light hiding under her bushel and whisk her away from her hum-drum life. Unlike Davie Jones I did not grow up in Nowhere, Mississippi, the daughter of an alcoholic mother. I did not spend most of my childhood a selective mute after a traumatising incident. I was not called Monkey Night by colour-struck classmates. And I never made a play for the most popular boy town that went so badly wrong I was forced to flee town in the dead of the night. Davie Jones moves to LA where she becomes a jazz singer. She resigns herself to an uneventful existence, but fate has other plans. Soon the bullies she left behind are reappearing in the most unexpected places and her dreams are once more within reach. 32 Candles is my favourite book this year. The prose is fun and frothy and rattles along at a swift clip. Davie Jones is resilient, bold, daring and determined to take her turn in the spotlight even in a world that says black girls don’t deserve magic. It’s a clever sequencing that manipulates chronology to thwart reader expectations and ramp up the tension. The combination of a Hollywood-worthy plot with thought-provoking themes adds up to a story that’s layered and interesting without being dogmatic or heavy. It’s like The Colour Purple meets I Know Why The Caged Bird Sings meets Molly Ringwald. Trust me, you’ve never read anything like it. Ernessa’s latest book, The Awesome Girl’s Guide To Dating Extraordinary Men, is also out, now. You had me at hello with this one. Now I HAVE to get this book. I’m almost afraid to click on over to Amazon and see how much it is because whatever it is, I’m paying it! Great review. Trust me, it’s worth every cent. It’s the kind of book you read and lend to all your friends and then read again. this looks like a cool read!I’m about to research this one some more!